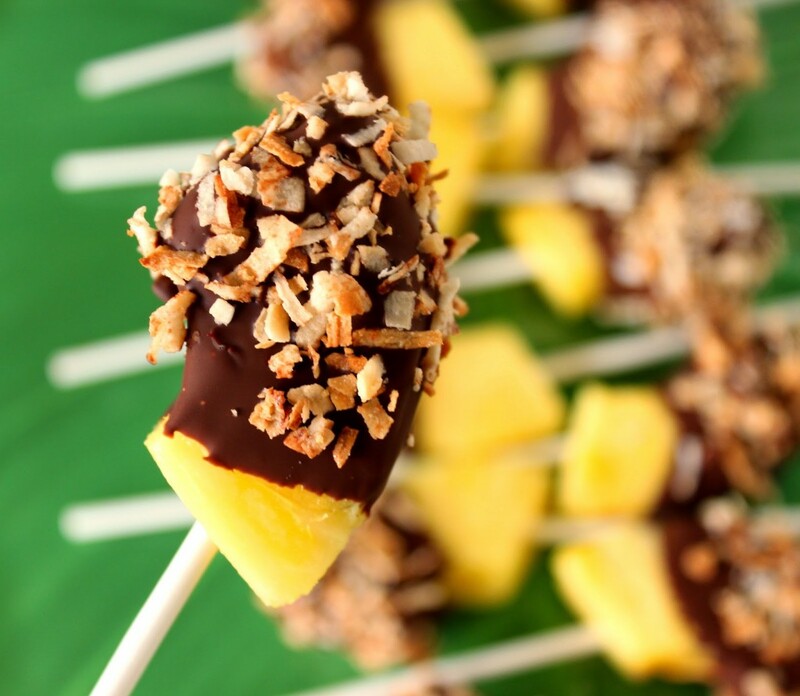 These Frozen Chocolate Dipped Pineapple Pops are the perfect way to cool down on a hot summer day! Make some today and stick them in the freezer to have on hand all throughout the summer! Out of the corner of my eye, I spotted something in the frozen foods case at Costco that instantly made my head spin with inspiration and excitement! The next thing I knew I was happily whipping up these Frozen Chocolate Dipped Pineapple Pops at home in my kitchen, and I’m totally anxious to share them with you today! 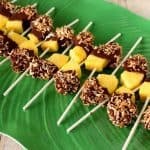 **Please Note – The printable recipe card with detailed instructions and complete ingredient measurements for making Frozen Chocolate Dipper Pineapple Pops with Toasted Coconut is available near the end of this post. These Frozen Chocolate Dipped Pineapple Pops are super simple to assemble and require only 4 ingredients to make. With the kid’s summer vacation looming, and with snacking mouths to feed, these will be the perfect treat that is sure to please all those hungry kids. Plus, Frozen Chocolate Dipped Pineapple Pops are a fun and healthy snack which is a perfect treat for a hot, summer afternoon. Cut pineapple slices into 2″ – 3″ pieces (canned or fresh pineapple works equally well for this). Insert a sucker stick or popsicle stick into each pineapple piece and lay them on a baking sheet. Dry each pineapple piece with paper towels and then freeze them for at least 20 minutes. Meanwhile, melt the chocolate chips and coconut oil in a microwave-safe bowl until smooth and creamy. Toast the coconut in a dry pan, stirring frequently until the coconut golden brown. 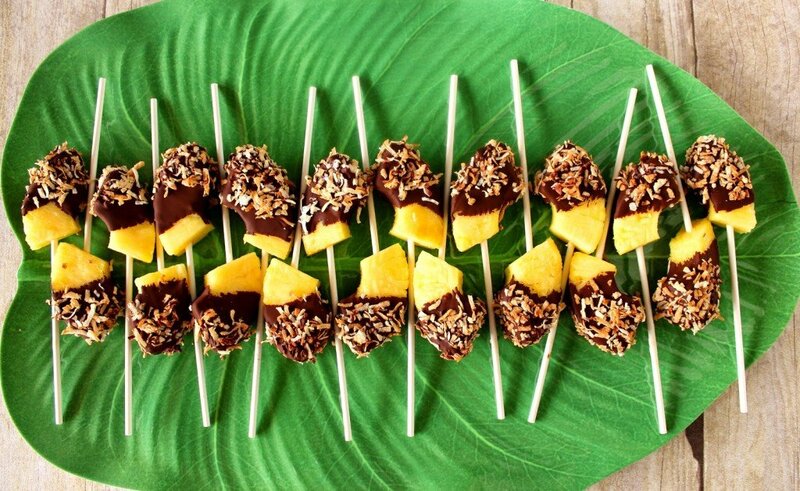 Dip the frozen pineapple pops into the melted chocolate and then into the toasted coconut. Freeze again until ready to serve. Hey, Gang! 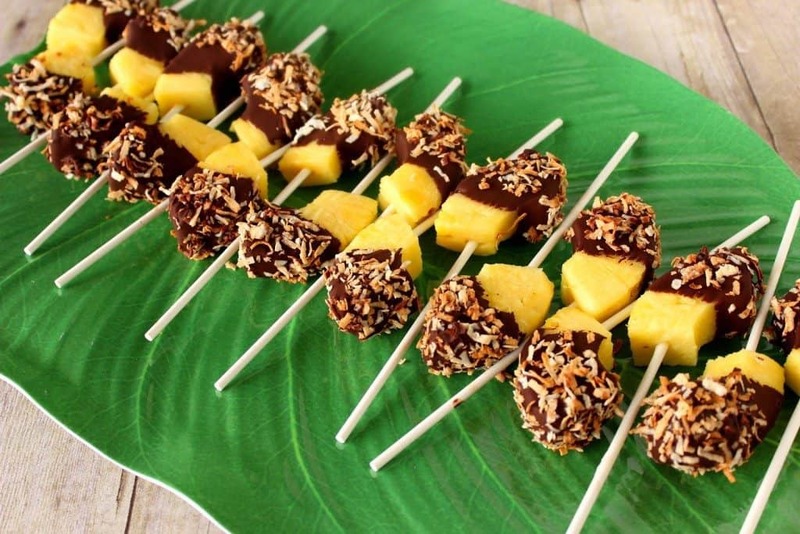 if you’re planning on throwing a luau this summer, keep these Chocolate Dipped Pineapple Pops with Toasted Coconut in mind to serve to your party guests! Everyone will love them, which will make you the hostess (or host) with the mostess (or most)! 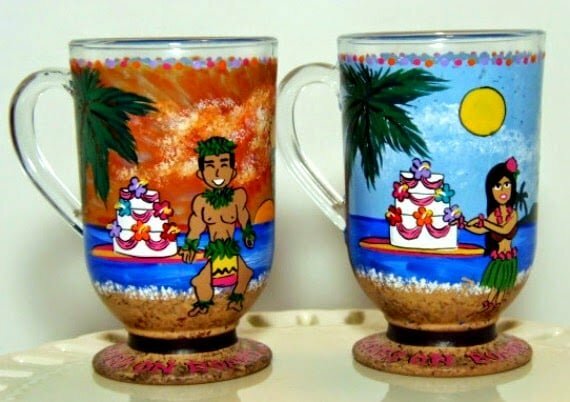 This recipe is featured on No-Biggie 25 Hawaiian Party Foods. WOOT! These Frozen Chocolate Dipped Pineapple Pops are the perfect way to cool down on a hot summer day! Make some today and stick them in the freezer to have on hand all summer long! Insert the sticks into the cut pineapple slices. Dry each slice of pineapple with a paper towel. Place onto a baking sheet and freeze for at least 20 minutes. In a medium-sized microwave-safe bowl, melt the chocolate chips and coconut oil on medium/low power (stirring frequently and checking often) until they're melted and smooth. In a dry skillet, toast the coconut until golden brown, stirring frequently. This happens quickly so be sure to keep an eye on it and don't walk away while toasting. 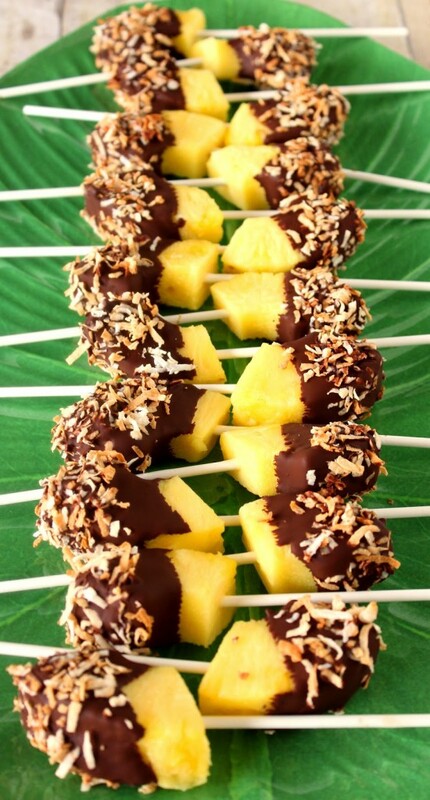 Dip the frozen pineapple pops into the melted chocolate and then into the toasted coconut. Freeze again until ready to serve. These can be bagged individually and kept in the freezer for up to 6 weeks. medium size microwave-safe bowl, baking sheet, parchment paper or wax paper, popsicle sticks or sucker sticks, measuring spoons, measuring cup, paring knife or chef's knife, cutting board, medium skillet, wooden spoons, shallow bowls for dipping. I sincerely hope you’ve enjoyed this recipe for Chocolate Dipped Pineapple Pops with Toasted Coconut as much as I’ve enjoyed bringing it to you! 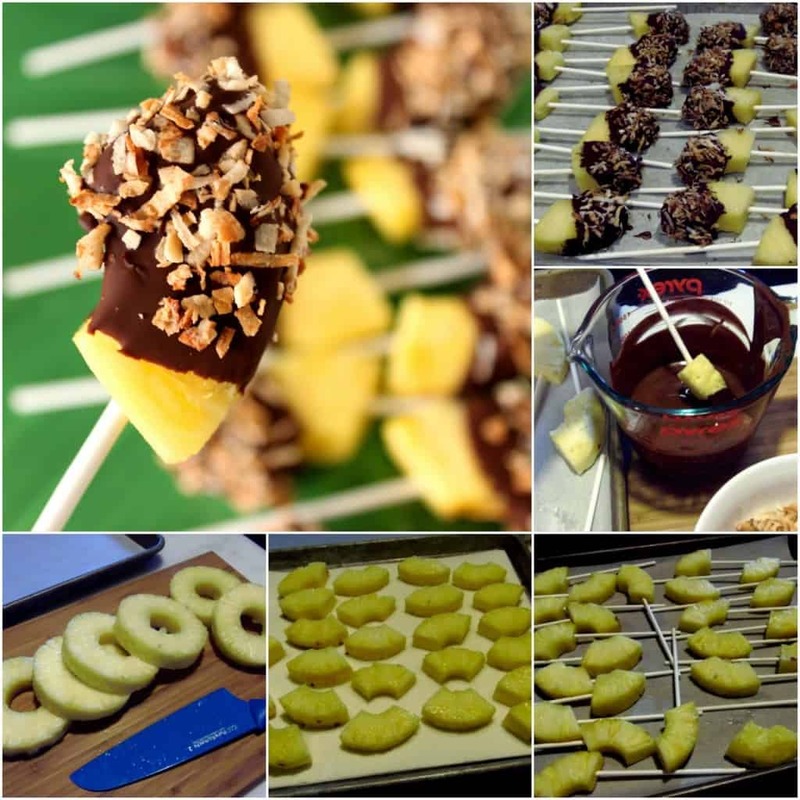 Should you have any questions regarding this recipe for Chocolate Dipped Pineapple Pops with Toasted Coconut, or anything else you’ve seen on my site, please don’t hesitate to contact me directly, or leave me a comment in the comment section below. It is always my distinct pleasure to get back to you with a reply just as soon as I possibly can! BEAUTIFUL – love those round slices, I wish I had some of these in my freezer right now! Love getting inspiration from shopping, restaurants and magazines. These look wonderful!